Invicta 24448 Subaqua Noma III chronograph men's dive watch features a 50mm wide and 18mm thick solid stainless steel case with a unidirectional rotating bezel and textured screw down crown with function pushers. Invicta 24448 is powered by Japanese SII VD53 quartz chronograph movement. This stylish watch also features a textured gunmetal and sharp looking red dial with white accents gunmetal luminous hands and dot hour markers along with the chronograph, 12/24-hour time and date display functions, scratch resistant mineral crystal and water resistant to 500 meters. Invicta 24448 is equipped with a 29mm wide solid stainless steel bracelet with a fold over safety lock clasp. 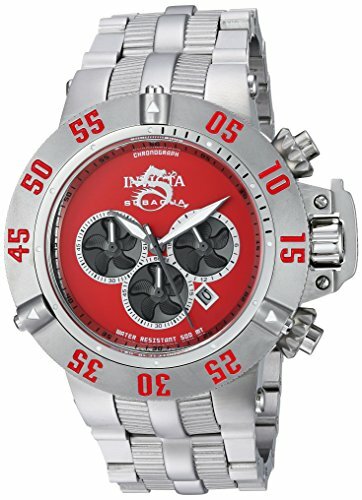 Invicta 24448 men's Subaqua Noma III gunmetal & red dial steel bracelet chronograph dive watch is brand new and comes in an original Invicta gift box and is backed by a 5 year limited warranty. Led with expert engineering, and always ready to face the depths, no feat or occasion will ever be too great for Invicta's Sub aqua to handle. The sheer magnitude of this mighty timepiece is superbly executed with surgical-grade solid stainless steel, Swiss automatic movements, and multiple color options of ionic plating. Managing up to 500 meters of water, finished off with a unidirectional rotating bezel, integrated shock resistance, and Invicta's luminous Tritnite? hands, the Sub aqua is the diver's definitive in negotiating any adventure by sea or by land.